Price Drop! Was: $99.95 Now: $39.97. For a limited time only, while stocks last. 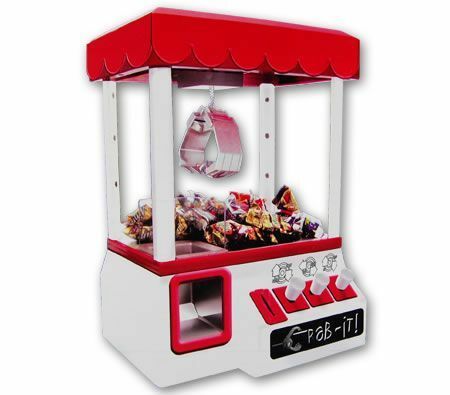 Experience the thrill and excitement of Carnival Arcade Style fun in your very own home. Fill the device with your favourite treats or toys and put your patience and skill to the test. Machine can be operated with Prize Tokens or conventional coins. Use the Multi-directional Controls to navigate your way to success and claim your prize. Prizes can be conveniently refilled from the Roof Hatch. Can you collect a prize before the music stops? Great gift idea for kids or adults that are kids at heart! Ideal for Offices, Game Rooms, Bars or Parties! Great Gift Idea for Friends & Family! This product comes with a 30 Days Warranty, please click here for details.